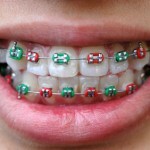 Orthodontic treatment is based on the principle that if a force is applied to a tooth for a period of time it will move. The applied force produces changes in both the supporting structures and in the pulp of the tooth. Pathological changes have been reported in the pulp in response to these forces so the aim of this review was to investigate the relationship between orthodontic force level and pulp reaction in humans. The authors undertook a detailed search of the PubMed/old Medline, Web of Science, Embase, CINAHL and the Cochrane Library databases. They undertook handsearching of key dental journal and reference lists of identified studies. Studies in humans that quantified, orthodontic force magnitude, type of tooth movement, duration of force application, and description of pulpal reaction were included. Screening of abstracts, data abstraction and quality assessment was conduced independently by two authors. The forces used in human studies ranged from 25–4400 cN. The duration of force application ranged from 20 seconds to 152 days.